The Aqua Lung Full Face Mask Bump Helmet was designed for professional divers using a full face mask in low visibility conditions or where overhead obstructions exist. Designed for professional divers using a full face mask. Intended as an underwater bump helmet only. Not intended or rated for swift water, high impact, etc. Please contact our Public Safety Sales Dept. for questions and/or pricing. Multiple impact liner, awesome drainage (13 Ports), unmatched cinch fit (4 Point), closed cell foam, stainless steel hardware, Full ear coverage. Sizes SM 21 1/2"-22 1/4" MD 22 1/2"-23" LG 23 1/4"-23 3/4" XL 24". 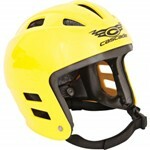 We are overstocked on Yellow Cascade Full Ear Helmets. Quantities limited to in stock only. 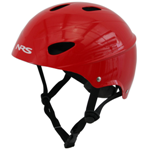 The NRS Havoc Helmet is your one-size-fits-most solution to whitewater safety. Their DialFit system lets you quickly and easily adjust the fit to accommodate almost any head size. NRS Havoc Helmets are special order. Please allow additional lead time. Helmets for various activities are designed and certified to protect your head in different ways and from different impact levels. The impact you might receive in one situation can be very different from another. Also, helmets are shaped with specific activities in mind to provide protection to the parts of the head most likely to be impacted. For liability reasons and your safety, it is important to understand that no helmet can guarantee complete protection in all situations.